What Is The Best Horse Riding Body Protector On The Market? A body protector is right up there with a riding helmet in terms of kit that you really need in order to enjoy horseriding as safely as possible. A body protector can save you from winding, broken ribs, or even worse. You really should consider investing money in one of these, even if you have a horse that is safe as houses – who knows when a sudden, spooky lorry might come speeding behind you and beep its horn? Horses are essentially wild animals, and riding is essentially a dangerous sport. So why would you not spend the time researching the best safety equipment money can buy? Your body and your health are vitally important – without either one of these you couldn’t keep riding! 2.1 1. Why do you need a body protector? 2.2 2. Will an inflatable vest or jacket provide enough protection? 2.3 3. How do you wear a body protector? 2.4 4. What measurements do you need to order a body protector online? 2.5 5. How do you measure for a good fit? 2.6 6. How can I be sure my body protector fits right? 2.7 7. How important is fit? 2.8 8. What if you can’t find a good, snug fit? 2.9 9. How do you put on a body protector correctly? 2.10 10. Why does my body protector seem to loosen up after a while? This is a truly high quality piece of equipment, designed to protect you as much as humanly possible in the event of a fall. It is designed from beginner levels all the way up to Four Star, so you will be protected no matter your level of riding. Impact absorption – This is the most important feature of any body protector. The ability to absorb the impact if you fall off will save your bones from harm, and this vest has dual density padding and shock absorption to take the brunt of any fall you might experience. 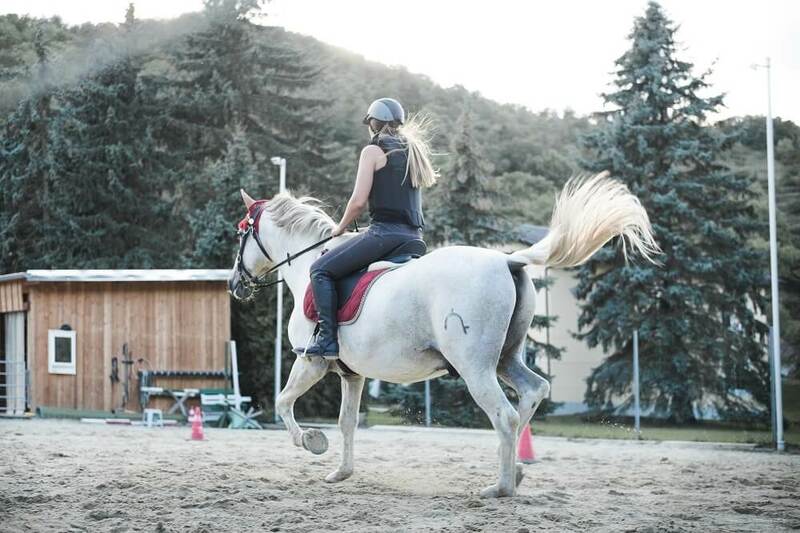 Flexible for comfort and mobility – Being comfortable in the saddle while wearing a body protector is a must, and this one is so flexible that you might not even know you’re wearing it! Customisable fit – The zipper front and adjustable side laces mean that you can make this safety vest fit you, whatever size or shape you are. Sizes run small – Users have reported that this vest should be purchased in a size larger that you are used to, as the sizes can be too small. A truly sophisticated, well-made safety vest, this one outstrips the competition on comfort and functionality. It is a step above some others in price, but you are paying for your safety so what could be more important? 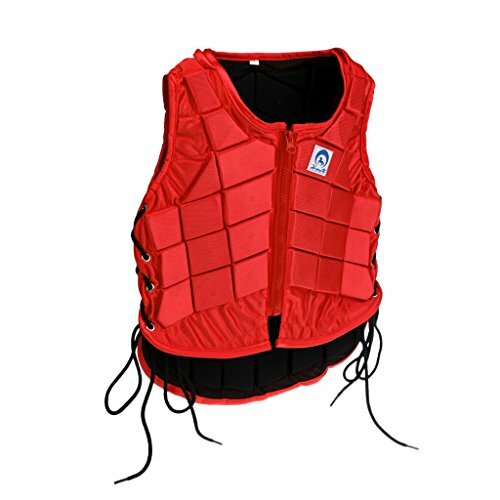 This vest offers a high level of comfort and a good fit, while offering a brilliant level of safety. It is non-restrictive, and comes in a funky colour too! What’s not to love? Zippered front and adjustable laces – These adjustments make it easy to tailor the vest to your specifications. Provides high levels of protection – Impact reduction and shock absorption are what you are looking for in a safety vest, and this one has both. If you come off you will be protected, never fear! Scalloped lower front for less restriction – This means you will be able to breathe comfortably, and allow for the extra movement riding will give. Extended padding for tailbone protection – The extra padding on the lower back means that your coccyx will be protected in the event of a fall. Kids’ sizes are smaller than advertised – Even the manufacturer states this, so you would be wise to order a size up if you are buying one for a child. 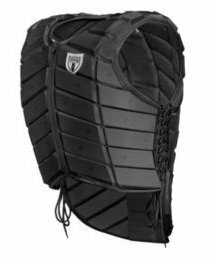 This is a great body protector in the mid-range of prices. It offers the same protection as a more expensive one, and is available in bright colours, making it ideal for wearing out and about in the summer when you don’t need a jacket over the top. This breathable vest affords a high level of protection, along with comfort and breathability. It is affordable and adjustable, making it ideal for those on a budget who want to be protected. Adjustable for individual specification – Having laced sides means that you can adjust this safety vest to fit you exactly. This is a great plus point for comfort. High quality materials – Made from strong polyester and EVA, this vest is designed to withstand the rigours of riding. Tailbone protection – Having that slightly longer section in the back means that the entire of your back will be protected, which is ideal if you happen to fall on your, shall we say, posterior! Only comes in one colour – If you are looking to be seen on the roads, you will need some high-vis over the top in order to be more visible to road users. A great all-round protective vest, this one won’t break the bank at the same time as it protects you from breakages. 1. Why do you need a body protector? This item of equipment is required for event riding during the cross-country phase. Additionally, if you are working with an unruly horse or practicing jumping, a body protector is a good thing to have. 2. Will an inflatable vest or jacket provide enough protection? No, these items of equipment are meant to be worn over a body protector for added protection. 3. How do you wear a body protector? These garments are meant to fit closely, so most riders wear a light, close-fitting jersey next to the skin with the body protector over it. Outerwear and other garments are worn over the body protector. If you do plan to wear heavier clothes under your body protector, be sure to take your measurements while wearing that clothing. 4. 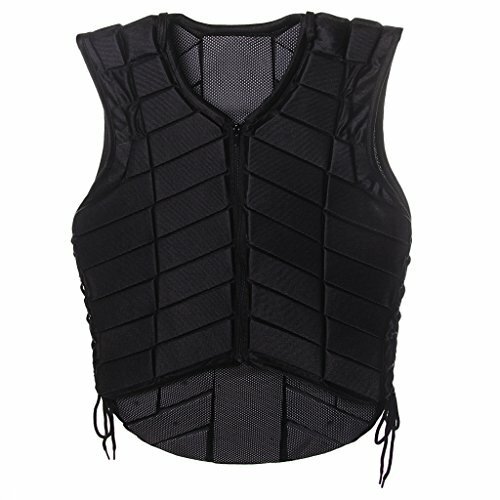 What measurements do you need to order a body protector online? The required measurements vary from one manufacturer to another, but all include length, waist and chest, with the chest measurement being the most important. Most body protectors can be adjusted at the shoulders and the waist. 5. How do you measure for a good fit? Measure the largest part of your chest, making sure that the measuring tape is level and fits in a snug (not tight) manner. Measure from your natural waist in front, over the shoulder to the natural waist in back. Double-check and record your measurements. Compare them with the size chart corresponding to the body protector you wish to purchase. If you find that you are between sizes, choose the smaller size because you want your body protector to provide a snug fit. 6. How can I be sure my body protector fits right? Neckline and shoulders should lie flat. If they tend to gape open, it means you need a shorter length. Front length: The front of the garment should reach the breastbone and cover the bottom rib. If your protector is too long or short, you can probably adjust it at the shoulders. Back length: It is important that you have between 2 and 4 inches distance between the bottom of your body protector and your saddle. If the bottom of the protector presses on the saddle, it will be pushed up against your neck and may interfere with your movements in the saddle. 7. How important is fit? If your body protector does not fit correctly, it will not be effective. If you are not able to find a snug, secure fit with one type of protector, you’ll need to try a different manufacturer. Fit varies depending on both the manufacturer and the style of the garment. 8. What if you can’t find a good, snug fit? If you have tried several ready-made body protectors without luck, you may have to have one custom made. 9. How do you put on a body protector correctly? Start by loosening all the closures on the garment and flexing it gently. Put it on and fasten the waist and chest closures for a comfortable, snug fit. If you’ve chosen your size correctly, you should have room to tighten or loosen the straps more if you need to. 10. Why does my body protector seem to loosen up after a while? Some models warm up and start conforming to the contours of your body. If you find this happening, check the garment’s fasteners after ten or twenty minutes and adjust them accordingly. Having a good body protector is so important. Keeping yourself safe on a horse, even the safest horse in the world, is absolutely paramount, so making sure you have the best horse riding body protector is almost as important as making sure you have a good riding hat. If you are looking for the highest spec protector you can find, and if you have money to spend, look into the Tipperary Eventer Vest. If you want a breathable, comfortable body protector in a cool colour that will protect your top as well as your tail, then opt for the Monkeyjack EVA Padded Breathable Horse Riding Equestrian Body Protector, and if you want a high quality protective vest then you should go for the Jili Online Adults Equestrian Protective Vest. I really never thought about this as an optional piece of equipment when learning to ride my horse. Maybe now that I have figured out how to ride a little better, I do not wear it as much, but you can never be too careful.